Ninja Boy Adventures is an strategy game inspired in the arcade’s classic Bomberman. Take power ups, put bombs and destroy all the enemies to complete the levels in this amazing adventure. Play 30 challenging levels distributed in 11 zones and 3 imaginary worlds. Eliminate all enemies and bosses to clear all the levels and complete the game. Up to 4 players at the same time in a incredible collaborative mode. Play multiplayer online with up to 4 players at the same time over Internet. On your Apple TV you can also play offline on the same device. Now is time to demostrate your friends who are the best! Explore worlds filled with gorgeous environments, hilarious characters, 8-bit sounds effects and music and stunning graphics. Pay just one time and play all you want. There is no hidden in-apps and annoying ads. 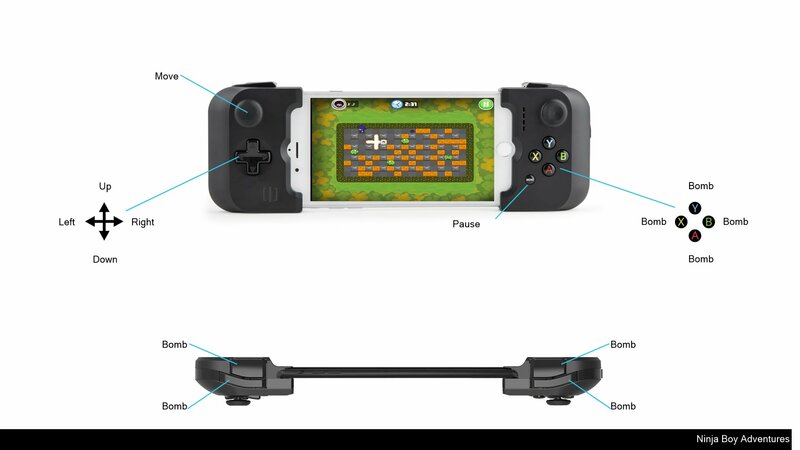 Now you can play the game with your bluetooth controller. Up to 4 controllers can be connected at the same time. Of course touchscreen controllers are also available. Unlock all the achievements and connect to Game Center to beat the high scores. We have designed the game to be 100% compatible with all iOS devices. Download the game once and you will have it on all your devices. Amazing! Join now into the Ninja Boy Adventures! Thanks for playing Ninja Boy Adventures!